We’d love your help. 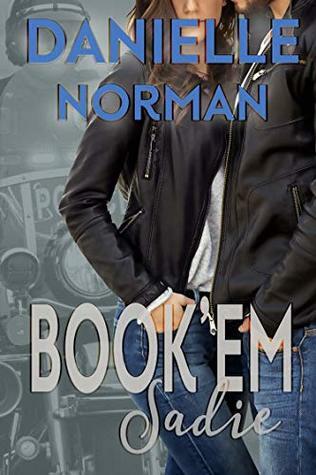 Let us know what’s wrong with this preview of Book'em Sadie by Danielle Norman. You fell in love with the Iron Orchids, but some of them didn’t get their story. Meet the badges, a group of strong female deputies. With Piper making the motors squad, she wants to see more female motorcycle deputies join the ranks. Piper- You came to know her in the original Iron Orchids series. She escaped a life where stealing for food was a way to eat and living off t You fell in love with the Iron Orchids, but some of them didn’t get their story. Meet the badges, a group of strong female deputies. With Piper making the motors squad, she wants to see more female motorcycle deputies join the ranks. Piper- You came to know her in the original Iron Orchids series. She escaped a life where stealing for food was a way to eat and living off the man was a way of life. Sadie- The only child of parents who are still happily married and can’t imagine a life that’s not paycheck to paycheck. She wants to be different starting with her high risk career. Harley- She is the queen of one-liners, unfortunately they’re at the most inopportune times. Kat- Growing up with four sisters it was hard to stand out, then add to it the fact that she’s Greek, it makes being original impossible. So she defied everyone and became a deputy. To ask other readers questions about Book'em Sadie, please sign up. And all of this happens before she wakes up and faces reality where in fact she is a 50 something mom with grown kids, she's been married longer than Theo’s been alive, and now get Before becoming a romance writer, Danielle was a body double for Heidi Klum and a backup singer for Adele. Now, she spends her days trying to play keep away from Theo James who won’t stop calling her or asking her out.